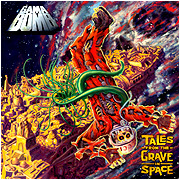 Album: "Tales From The Grave In Space"
Review: Gama Bomb is an Irish metal band that you probably haven't heard of, unless you're big into thrash metal. If you haven't already guessed by their name, the name of their album, or the album art, they're big fans of the same kind of horror and cheesy things that this site covers. Tales From The Grave In Space is Gama Bomb's third album, first released late last year as a free download. Yep, for free. (You didn't even get the option of paying for it until a few months later! Your move, Radiohead) This makes Tales the very first metal album released for free while signed to a label! And, upon reflection, makes this review seem late. The main attraction of the album is, of course, the music, though the album art is a close second. Gama Bomb play thrash metal, the style pioneered by bands like Metallica, Testament, Slayer, and the like. Just about every song of the twelve tell some pulpy, gory horror story in the space of about two-and-a-half minutes. (The longest track, "Skeletron", is three minutes and eight seconds) From scheming, Shakespearan witches ("Three Witches") to marauding mummies ("Mummy Invasion") and even killer scarecrows ("Escape From Scarecrow Mountain"), it's all here. There are a few oddball tracks that talk about social issues, like "Mussolini Mosh" (which warns of the British National Party) or people that have influenced the band ("We Respect You") . The main problem with the album is it's variety - which is to say, there isn't much. Gama Bomb don't have the songwriting skills that Megadeth did in '86, and as a result a number of the songs are forgettable. They also take the philosophy "everything louder than everything else" to heart. The songs come as big waves of sound, the guitars, drums and bass blending together into an unstoppable cacophony. Tales From The Grave In Space is an album that doesn't give you a second to catch your breath. If you don't like thrash metal, this won't be the album that converts you to it. But if you aren't looking for another Ride The Lightning or Peace Sells, and you do want to hear some metal tributes to things like Zombi 2 and Escape from New York, then I think you'll like this album. They had me at the cover art. Gonna download this when I get home. Want to check out Skeletron. Skeletron is my favorite of the bunch. There's no one home, but the lights are on, a screaming mind of the Skele...TRRRROOOOOON!